Combine the potatoes, the rosemary and garlic in a saucepan,cover with water and add a teaspoon of table salt. Bring to the boil and reduce to a simmer. Cook until soft (approx 20 minutes). Meanwhile, cook the shallots gently in the olive oil for 5 minutesand set aside. When the potatoes are done, drain them, removingthe rosemary and garlic. 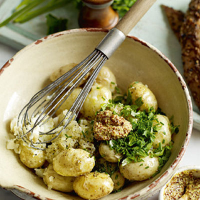 Place the potatoes in a bowl, pour over theshallot-olive oil mixture, add the wholegrain mustard and vinegar and crush with a fork or balloon whisk. Generously season with table salt, sea salt and freshly ground black pepper. Stir the chopped herbs into the potatoes. Serve warm or at room temperature with a tablespoon ofcreamed horseradish stirred through. Try with some grilledhot smoked mackerel fillets. An easy way to peel shallots is to drop them into a pan of boiling water for 1 minute. Remove them from the water, and the skins should peel off easily. This recipe was first published in May 2010.